SDS (sodium dodecyl sulfate or sodium lauryl sulfate) is a common detergent and protein denaturant. In laboratories, It is broadly used in cell lysis, protein analysis (SDS-PAGE) and membrane protein folding studies. In industry, SDS is used as a highly effective surfactant and is a key component in many cleaning products. SDS strongly binds to proteins and changes the protein conformation that affects the protein function. Complete removal of SDS in a protein solution is essential to fully recover the protein function and stability. 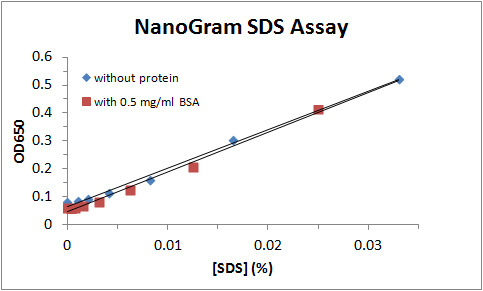 The NanoGram SDS Assay Kit (Catalog number SDS200) is designed for measurement of nanograms of SDS. The assay sensitivity is 0.002% SDS which is about 100 fold lower than its CMC value. The assay is based on increase of light absorbance at 650 nm of the dye MPS6 in the presence of SDS. The assay kit can be used for measurements SDS concentrations in samples with or without proteins. The assay is compatible with most biochemical buffers. It is not compatible with phosphate buffers. Inorganic phosphate interferes with the assay. The NanoGram SDS Assay Kit (catalog number SDS200) provides the reagent for measurement of 200 samples using 96-well plates. Cuvettes may also be used for measurements.